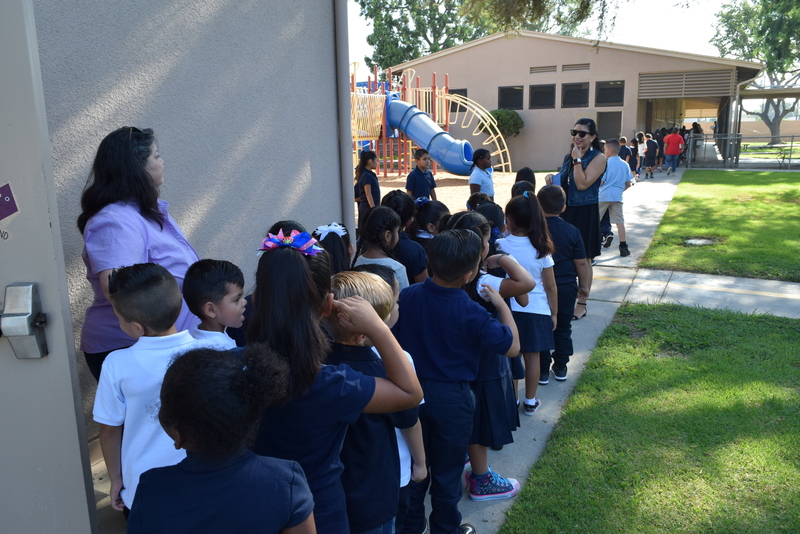 BELLFLOWER – Washington Elementary School welcomed 745 K-6 students for the first day of the 2017-18 school year on Aug. 28, a day that also marked the inaugural year for the school’s Spanish-English dual-immersion kindergarten class. Washington Elementary’s dual-immersion class aims to provide classroom instruction in both languages to promote bilingualism and biliteracy in younger students for life-long learning and cultural understanding. The academic offering builds on a dual-immersion program launched at the Intensive Learning Center five years ago. Bellflower resident Janea Albright said she enrolled her daughter, Riley, in the dual-immersion program because she believes in the value of learning new cultures and languages. “I like my class and I want to learn about math,” Riley Albright said during a break from the dual-immersion class. The dual-immersion class was so popular that it not only reached its registration limit of 24 students — it also has students on a waiting list. Washington Elementary’s new kindergarten dual-immersion class teacher is Ana Fletes, who taught first-grade English at the school last year. Fletes said that while combination of the first day of school and learning a new language was an obstacle for some at first, she watched as students became more relaxed and engaged in learning Spanish. 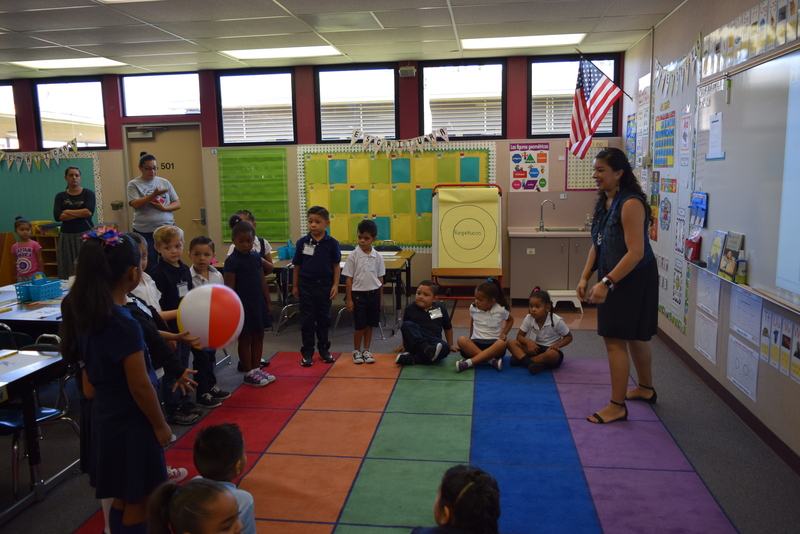 To help introduce the students to Spanish phrases, Fletes created a name introduction game that had her passing a beach ball to each student while asking “como te llamas?” or what is your name? Kindergartener Dravehn Afemata said he already enjoys learning Spanish in Fletes’ dual-immersion class, especially after playing the name introduction game. Principal Dr. Angelica Montelongo said one of Bellflower Unified’s goal is to promote bilingualism for students so that they can graduate from high school with the California Seal of Biliteracy on their diplomas. Dr. Montelongo said the school will expand the program each year. Beyond the new dual-immersion program, Dr. Montelongo said Washington Elementary is also working to improve attendance rates and provide greater technology accessibility to its students. Dr. Montelongo said the school offers a 2:1 student-device ratio for all grades. 082817_BELLFLOWER_FIRSTDAY_1: Teacher Ana Fletes (right) welcomes Washington Elementary School’s first Spanish-English dual-immersion kindergarten class with a name introduction game that asks ‘como te llamas?’ or what is your name? The first day of school was Aug. 28. 082817_BELLFLOWER_FIRSTDAY_2: Ana Fletes (center) teaches her Spanish-English dual-immersion kindergarten class a variety of Spanish words including names for boys and girls, bathrooms and playground. Ana Fletes (center) teaches her Spanish-English dual-immersion kindergarten class a variety of Spanish words including names for boys and girls, bathrooms and playground. Teacher Ana Fletes (right) welcomes Washington Elementary School's first Spanish-English dual-immersion kindergarten class with a name introduction game that asks ‘como te llamas?’ or what is your name? The first day of school was Aug. 28. 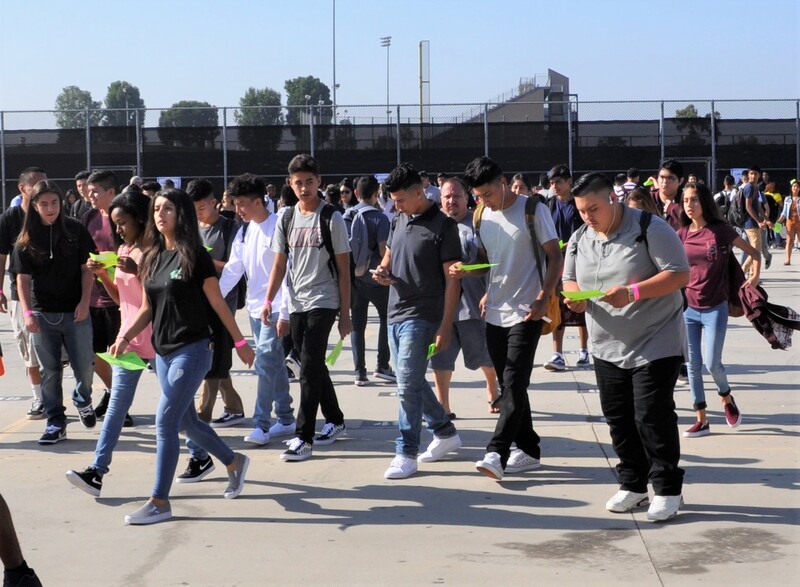 Bellflower Middle/High School students examine their schedules before classes commence on the first day of the semester, Aug. 28. The students spend their first days on team-building, college exploration and connecting with the school’s PRIDE mantra. 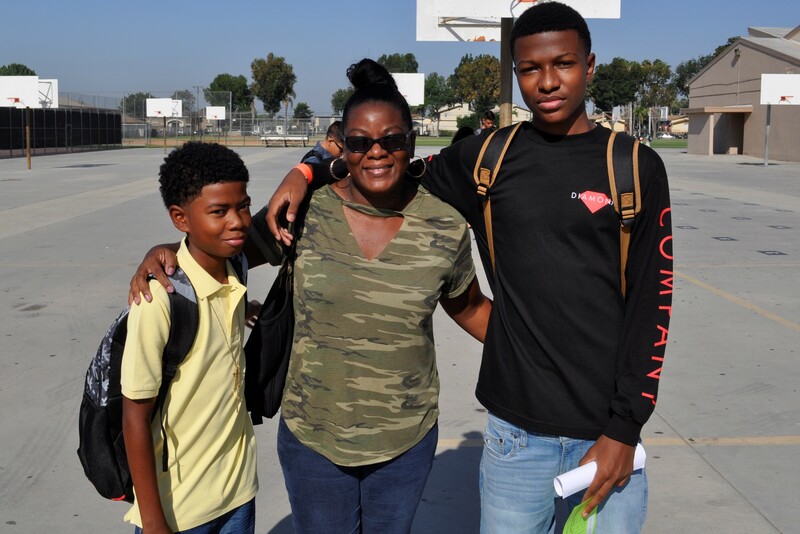 Tracy Hightower, secretary of the Bellflower Middle/High School Parent Teacher Student Association, drops off sons Julian, 12, left, and Angelo, 16, right, for their first day of school on Aug. 28. 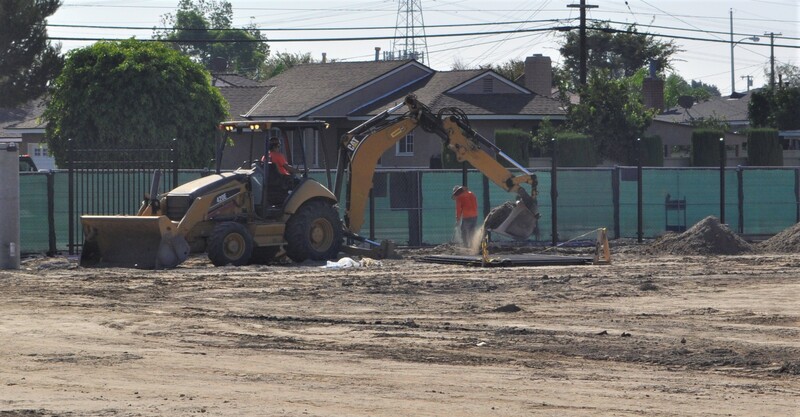 Construction crews are working on an artificial surface soccer field at Bellflower Middle/High School on Aug. 28, the first day of school. The field, which will also serve students on the frosh and junior varsity football teams, will be completed this fall.